The first theorem in Euclid’s Elements is about the construction of an equilateral triangle. To construct equilateral triangle , let be a line segment. Construct a circle with center passing through . Next, construct another circle with center passing through . Let be one of the intersections of the two circles as shown in the following figure. Draw segments and to complete the triangle. The key to the proof that is an equilateral triangle is the fact that congruent circles have congruent radii. The proof is very elementary as shown below. 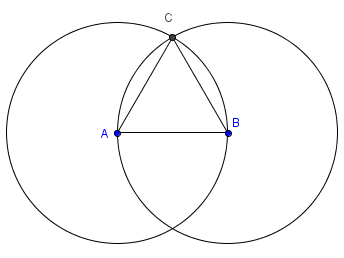 Given the two circles, one with center passing through , and another circle with center passing through , and their interesection , is an equilateral triangle. Congruent circles have congruent radii. It follows that AB latex$, , and are congruent since they are radii of congruent circles. We know that equilateral triangles have congruent sides, so is equilateral.